I’m going to send you off into the weekend with homework! This DIY is a MUST try, and really very easy so NO excuses! 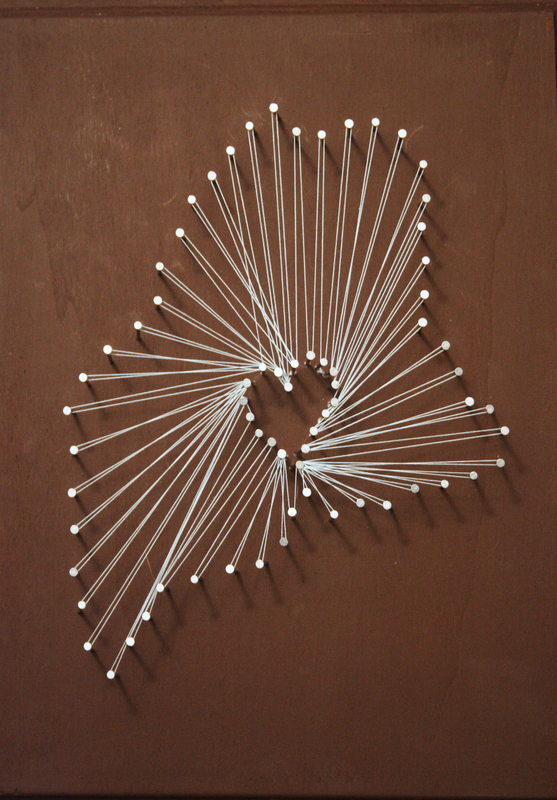 If you are looking for cheap, easy and adorable decor for your wedding try my string state on for size! First, as always, you have to get all your stuff together. This whole project cost me about 10 bucks and since you only need to make one, 10 bucks for some decor isn’t bad! 1) Wooden board…of some sort. I found this at Wal-Mart for about 3 bucks. 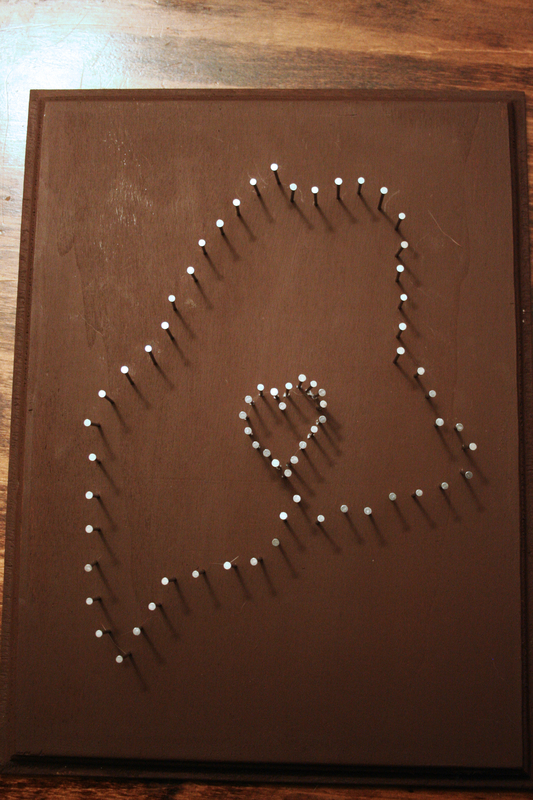 2) Paint, I chose brown because it would really help the light blue string show up…kind of a POP! 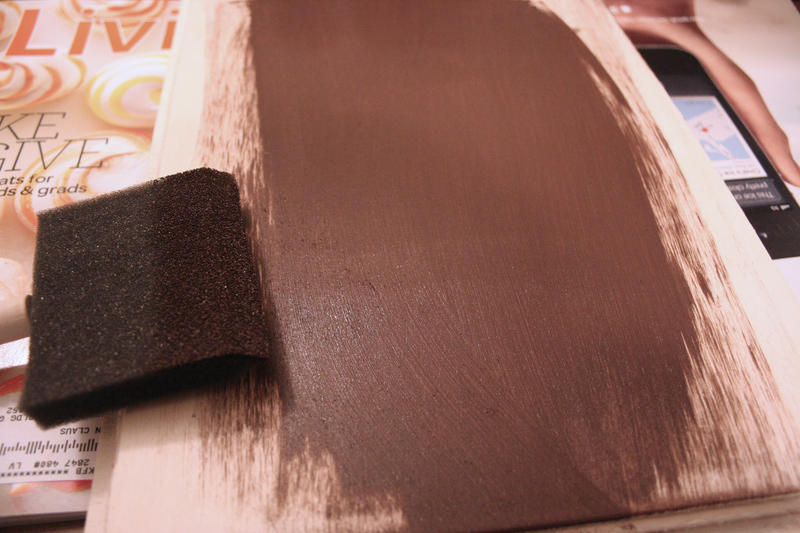 3) Brushes/sponges for the paint. 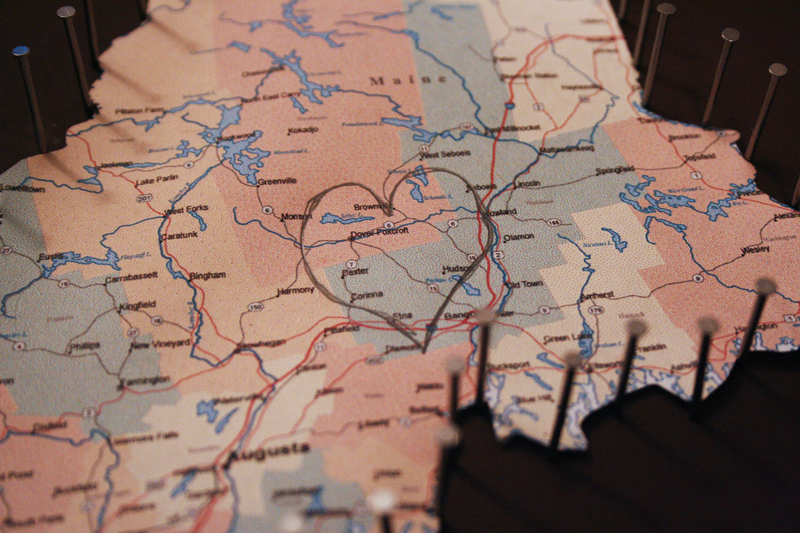 4) A map of your favorite state or a state that means something to the both of you. Maine is where we met, and where we are getting married so of course that’s what I chose! 5) Nails, I picked really shiny silver nails. If you can find decorative nails that you like, go for it! I went for cheap and shiny. 6) Thread. Any color you want! I picked blue because it’s the predominant color in the wedding. 7) Optional hot glue gun. This is for any stubborn nails that won’t stay in, glue ’em down! Then you have to wait for it to dry. Go watch some reality TV. It makes the time go by fast and really clears the head. 🙂 I suggest some Bachelorette action. Then maybe we can talk about how much of a douche Ryan is. 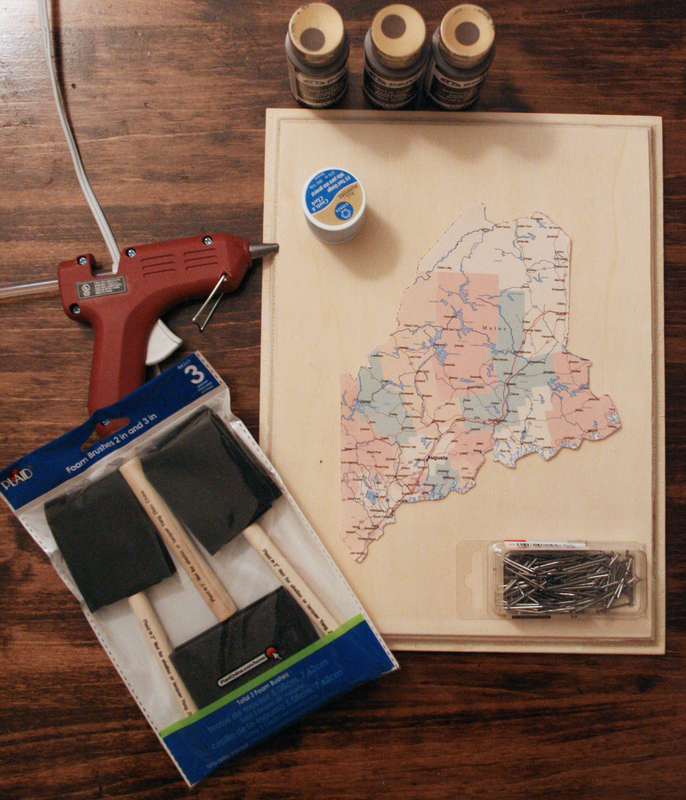 Make sure when you print out your map that it fills most of your piece of wood. If you are a Kansas/Oklahoma girl, you’ll want to hold your board horizontally, but for Maine Gals and California Girls (they’re undeniable) you’ll want to hold your board vertically. 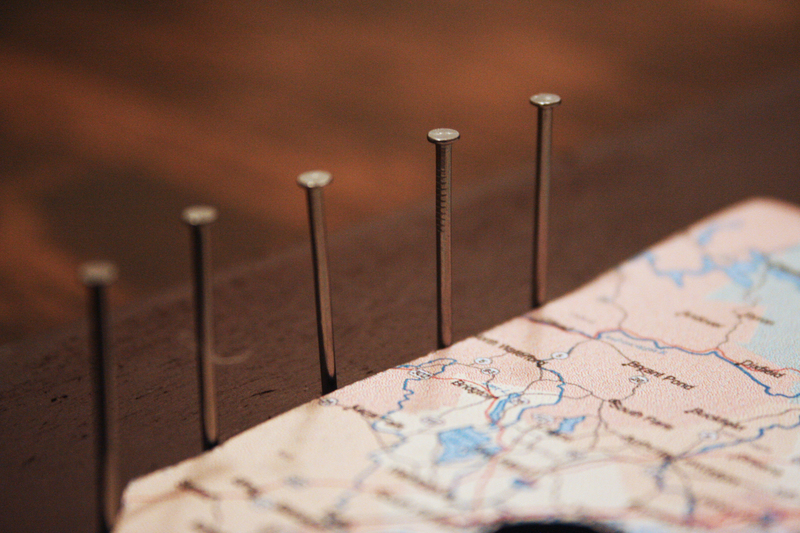 Now, to anchor the map in place, tap in a few nails on 4 sides of your map (bottom, top, right and left side). That way it won’t slide around on you as you hammer. After you’ve done that you can start hammering in the rest of your nails. You want to keep them pretty equidistant from each other and only hammer them down about a quarter of the way. You want the majority of the nail to be sticking up. Continue this all around the perimeter of your map. Once you are satisfied with the way all your nails look, it’s time to put a little love into this project. Draw yourself a heart on your map. Anywhere you choose. I wanted to draw it where my fiance and I live currently, but sadly it would have been too close to other nails, and I think it would have looked messy. Instead, I chose a random spot that I thought would look best. Now hammer your nails around the perimeter of the heart. They should be closer together than the nails around the perimeter of your map. After you’ve done that, then slowly and carefully peel the map up. 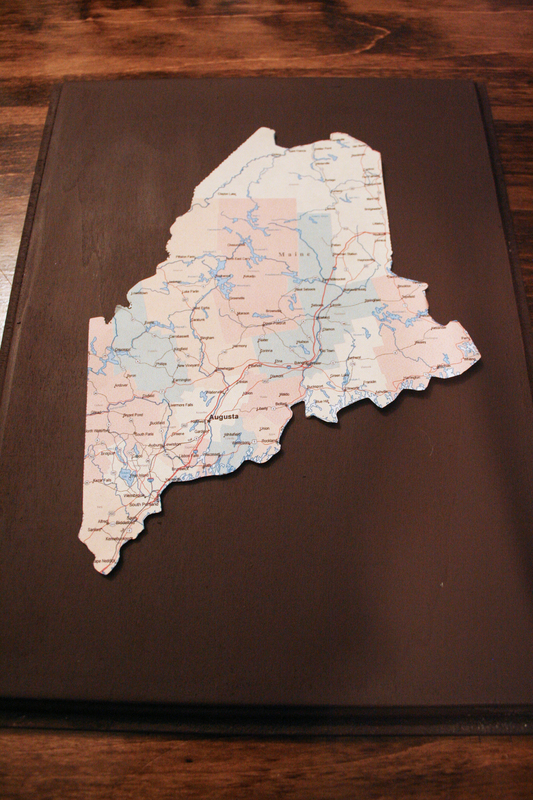 It will rip in the process, but unless you are using a precious family map (which I don’t advise…) ripping it is ok.
Looks pretty cool doesn’t it? Now it’s time for stringing your map. 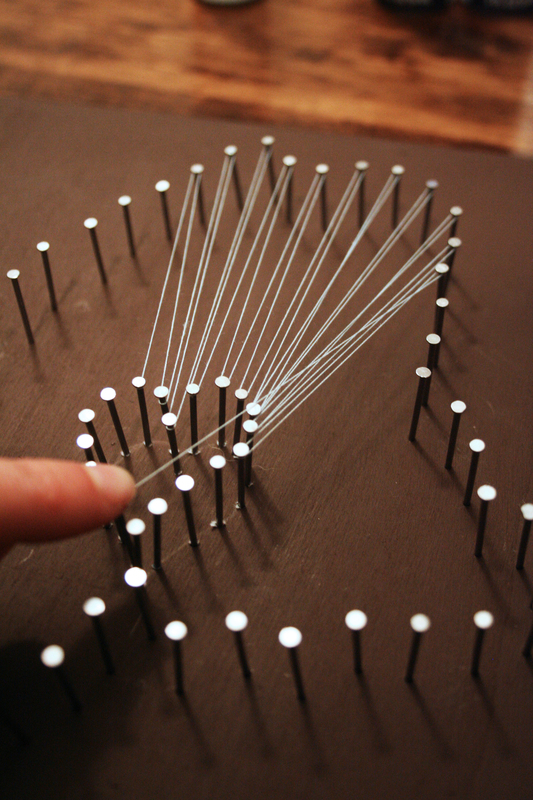 Take the end of your spool of thread and tie it to a nail in the heart. Make sure you make the knot good and tight. You can cut the tail of your knot off to keep it hidden. Now just start wrapping the string back and forth between the outside of your map back to the heart. You will have to wrap the nails in the heart more than once. Here is where you can use your desecration on how you want to wrap your string. Once you’ve gone all the way around, wrap the string around a few nails to keep it taut, and then make a knot. You are all done! Hang it up, prop it up on your bookshelf, or display it on your program table! Simple, cheap, and awesome decor! Hope you had fun making it! Such a sweet idea. And it turned out great!